Seramune Oral 300 ml bottle (Sera) a new foal's survival is riding on the colostrum or mother's first milk it receives or fails to receive during the first few hours after birth. If the foal does not nurse during those first few hours after birth it will become immunodeficient and may not survive. 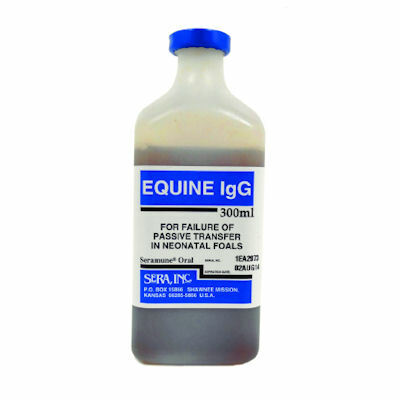 Seramune, made from equine origin serum, provides instant, reliable protection and gives the foal enough IgG protection to last through those first few weeks of life. Seramune is gamma irradiated to inactivate all potential contaminating microorganisms. Administer orally in two even amounts of 150ml 1-2 hours apart within the first 12 hours of life. Can also be given to healthy foals at birth to ensure they are getting full protection. 300ml Oral Bottle, Store in refrigerator as opened for as long as 3 years. Proven effective in more than 40,000 cases.